It's approaching dusk on the Amazon River, and the air is thick with moisture and mosquitoes. A small cluster of DEET-slathered Americans bait wooden fishing rods with scraps of beef, their eyes scanning the water for the seething piranhas just below the surface. "Stick the tip of your pole in and swoosh it around," instructs Johnny Balarezo, a guide with tour company International Expeditions, agitating the murky water as he speaks. "Piranhas are attracted to movement." Patience is not a requirement of piranha fishing. About 15 seconds in, a 13-year-old California girl screams, jerking her pole and catapulting a piranha into the air. All eyes follow the silver-orange blur as it arcs into the boat, landing with a thud. The fish flounders, its jaws snapping, awaiting the introduction of a finger or toe. Another yell erupts, this one from Balarezo. 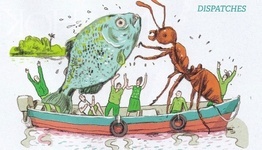 He's at the end of the boat, beneath an overhanging branch infested with Aztec ants. His flailing arm alive with tiny biting dots, the guide grabs a machete and hacks at the branch. It falls into the water, but not before hitting the boat and scattering more ants. People scurry away from the invaders, only to be snapped at by the piranha again.